Don't Let Your Product Become a Men's Restroom! Men’s restrooms at movie theaters might be the most biologically hazardous cesspools you may ever have the misfortune of experiencing. How does this happen? Do men somehow revert to their prehistoric dispositions? Does the lunar cycle impair accurate aim? Or are men just messy creatures? Here’s my explanation: In the morning, the janitor cleans up the restroom and makes it a welcoming place to empty the bladder. But at some point in the day, one distracted patron accidentally leaves a few droplets on the side of the urinal as he’s finishing up. The next patron comes along and before commencing his business notices the droplets on the floor. Not wanting to step on the mess, he positions himself a little bit further than optimal distance from the urinal all but guaranteeing he makes a bigger mess when he’s done. The next patron sees this bigger mess and positions himself even further away also contributing to the growing mess. The pattern continues until by the end of the day, patrons are standing near the doorway attempting to project physics-defying arcs where perhaps some portion of the stream hits the intended target. 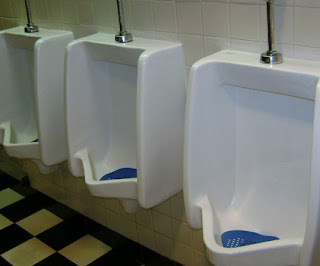 The tragedy of men’s restrooms serves as a cautionary analogue to product design and development. Every great innovator strives to create products that are delightful in how they solve problems with ease and refinement. Often, the early versions of successful products are exactly on the mark. But once the first person adds a piece of new functionality that is unrefined and difficult to use, they create permission for others who will follow to do the same and in fact, to create bigger and bigger messes until the product becomes a user experience cesspool. Don’t let this happen to your product! Be diligent with every addition of new functionality. Regularly test your task completion benchmarks to make sure your numbers are not degrading. Watch your server response times, funnel metrics and log files. Even better, build cluster immune systems so that bad check-ins can be rejected before they cause customer pain. Clean up the little messes before they become big messes. PS: If your job doesn’t involve cleaning men’s restrooms, please don’t ever complain about work again!